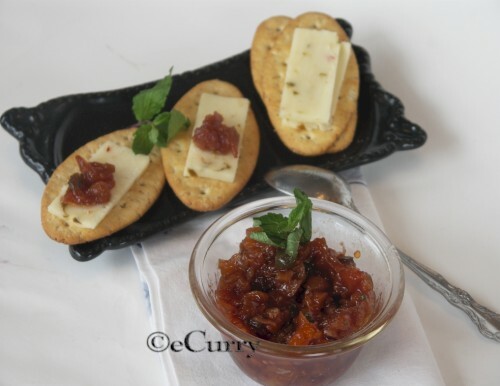 Sweet Chutney served after a full course meal is an integral part of Bengali cuisine. Every single day while I was growing up, we would end end our meal with some kind of sweet chutney which would be polished of the plate with fingers & later the fingers licked off clean. I guess that served as a kind of dessert… the Bongs as everyone knows are famous for their “sweet teeth”.. not just a “tooth”. The chutney would be made of any seasonal ingredient. In summer it would be raw mangoes or pineapples, in fall & winter – the irrestible red tomatoes. 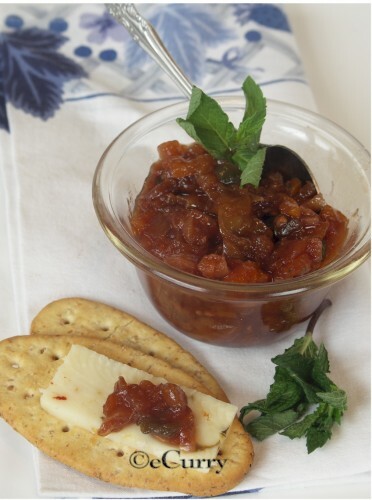 Chutneys bear different strains and traits & are enjoyed in different ways in different parts of the world. Be it be an after meal spoon, or a scoop on the cheese, or as any side… they are pretty versatile in their nature. With the abundance of so many different kinds of fruits & berries here, I make chutney with almost every fruit/berry I can get my hands on. Apricots are beautiful fruits! They taste delicous fresh, or canned or sundried.. in any form. 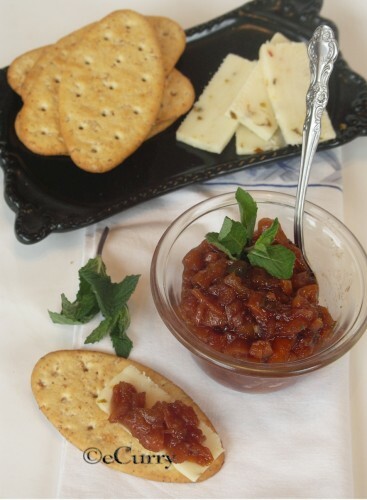 I have never cooked anything with them before….But,..
here is an Apricot Chutney… I have used Jalapeno & Mint with it to make it a Sweet & Spicy combination with the freshness of the mint. 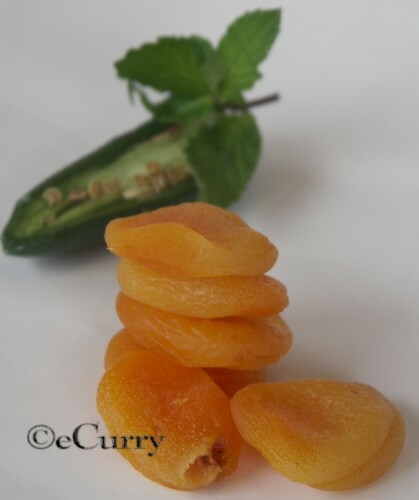 Sending this for AFAM:Apricot hosted at Siri’s Corner,, a brainchild of dear Maheshwari of ‘Beyond the Usual’. Note: If you do not want to use wine… just use any light juice. Roughly chop the Apricots & the Jalapeno peppers. Keep the jalapeno aside. Add the apricots & the ginger to the wine and let them soak for a couple of hours. Strain the apricots & ginger and keep the wine aside. Heat the oil, and add the red dry chillies to the oil. When they change color to brown, add the Jalapeno peppers. Stir fry for a couple of minutes and add the apricots & ginger that you had saved. Toss for another few minutes. Add the lime juice & zest, sugar, water and wine & boil at medium heat till a corn syrupy consistency is reached. Discard the red chillies after the chutney is done. Serve with crackers or bread topped on your favorite cheese. This is also an excellent side dish with poultry , meat or any thing you grill ! It is great for parties, as it can be prepared a few days before you want to serve. The taste actually matures in a few days time. I served it on Whole Grain Crackers, topped with Pepper Jack Cheese, … & saw it quickly disappear! Sending this to Culinarty’s Original Recipes. Very different way of making chutney, looks very delicious. Nice use of dried apricots,good entry for the event. my god.. this combination is a killer.. sweet and spicy.. lip smacking soma. Looks so good! Soma, sitting here and wishing this world was a little more advanced – then I could just put my hands in and take a lick! Wishful thinking! Me too, I have never used apricot in my cooking. The other day after reading some recipe, I went and got lots of dried apricots. Now they are lying the pantry waiting to be used. I love this idea. What can I subsitiute for wine, Soma? Supriya, U could use any light juice, like apple (or kids fruit punch etc), which would not overpower the flavor of apricot. U can skip the juice if u are using fresh or canned. the juice/wine softens the dried apricots a little bit. The combination of jalapeno and apricot sounds very interesting. pagol Bhabini ekdom:-) aaj kal kar biye barite shob catering. amaro oi shaal pata/kola pata te lomba lomba begun bhaja, mansho, mishti pulao ar chutney khete ichey kore:-). ki shundor gondho beroto gorom khabar er! These are party delights:-) & easy on the host. 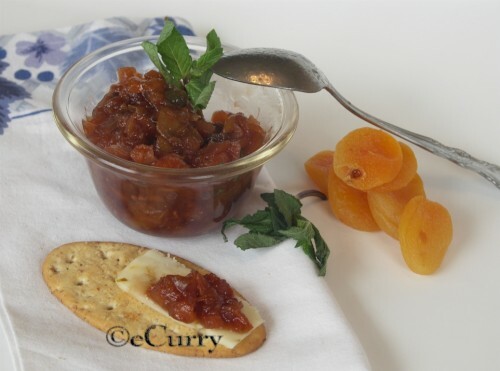 Apricot chutney looks delicious Soma!!! My taste buds are tingling with the sight of the chutney. I can feel the taste of spicy jalapeno and sour and sweet apricots. Nice entry. Mmm, looks so tasty! Nothing like a nice tangy chuntney! Wow,lovely.never tried apricots this way. Wonderful recipe. I am thinking of substituting apricots with dates. Do you think it is a wise substitution? Thanks for sharing it with the Original Recipes Round-Up!